Germany players celebrate with the trophy. The 2014 FIFA World Cup Final was a football match that took place on 13 July 2014 at the Maracanã Stadium in Rio de Janeiro, Brazil to determine the 2014 FIFA World Cup champion. Germany defeated Argentina 1–0 in extra time, with the only goal being scored by Mario Götze. 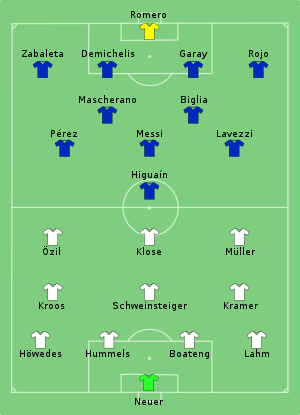 The match was the third final between the two countries, a World Cup record, after their 1986 and 1990 matches, and billed as the world's best player (Lionel Messi) versus the world's best team (Germany). Penalty shoot-out if still tied. ↑ "Tactical line-up – Germany–Argentina" (PDF). FIFA.com. Fédération Internationale de Football Association. 13 July 2014. Retrieved 14 July 2014. ↑ "Groups & Schedule". BBC Sport (British Broadcasting Corporation). Retrieved 14 June 2014. ↑ "Matches". FIFA.com (Fédération Internationale de Football Association). Retrieved 14 June 2014. This page was last changed on 2 October 2018, at 06:02.